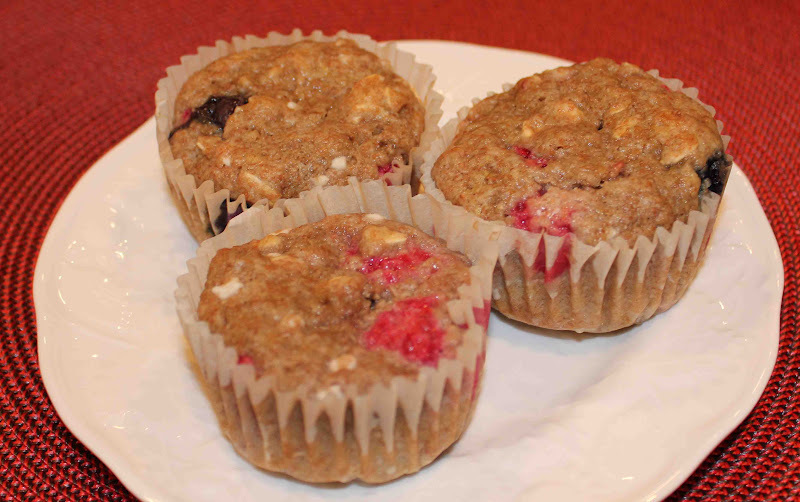 If you’re a fruit lover, you’ll love these healthy banana berry muffins! Loaded with mixed berries, bananas, cottage cheese (or yogurt), and oats, you won’t have to feel guilty about eating these muffins for breakfast or a snack. My sister and mom made them a few weeks ago, and when they brought some over for me to try, I absolutely fell in love! This recipe came from the blog, Eighty Twenty in which the author posts 80% healthy recipes and 20% “just plain good” recipes. Go take a look if you haven’t already…I’ve already bookmarked quite a few recipes. In terms of taste, these muffins are extremely moist (probably from the bananas). They are sightly sweet from the berries, and have a 4g of protein from the cottage cheese and egg whites. Drizzle them with Colorado honey (my favorite) or a pat of butter, and you’ve got a perfect snack. In addition, I’m pleased to announce these muffins have NO butter…instead they’re packed with heart-healthy ingredients you should probably be getting more of. 1. Preheat oven to 365 degrees F. In a large bowl, combine sugar, mashed bananas, cottage cheese, egg white, and vanilla extract. In another bowl, combine flours, oats, baking powder, and baking soda. 2. Add dry ingredients to wet ingredients and stir for about 10-15 strokes, just until dry ingredients are moistened. Fold in 1 cup frozen berries. 3. Place muffin liners in a muffin tin (regular size). Fill each muffin cup 3/4 full with batter. To the top of each muffin, add a couple of remaining frozen berries. Sprinkle the top of each muffin with a dash of sugar. 4. Bake for 15-18 minutes, or until toothpick inserted into the center comes out clean. Allow to cool 5 minutes before serving.